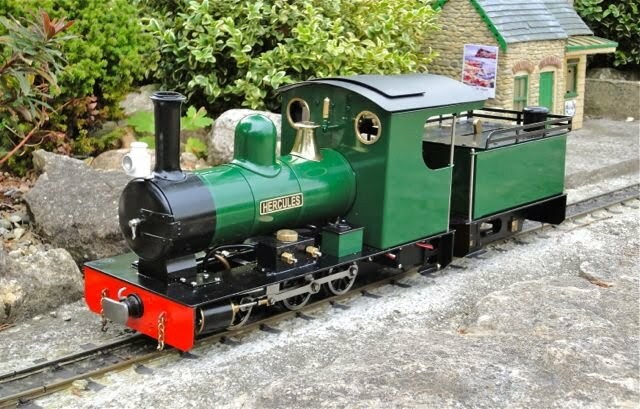 The Hercules is one of a range of models produced by the Cheddar Model Company. 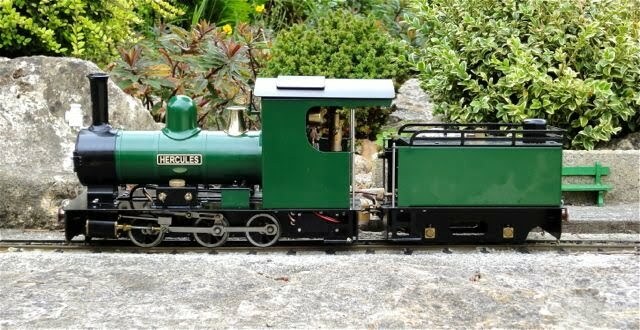 It is large and powerful with 5/8" cylinders, Turner valve gear and a highly effiicient boiler with water tubes and a ceramic burner. It features a gas regulator that holds the pressure constant and a water pump in the tender. 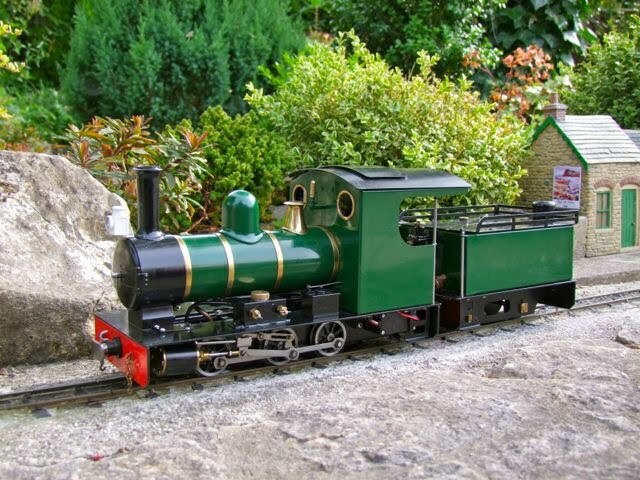 I have always had a liking for narrow gauge tender locos and have been tempted to create one from my Accucraft Wrekin, but then Simon Whenmouth at anything Narrow Gauge said he was due to buy one and I was hooked. Here it is at Summerlands, just after I arrived home from collecting it. Well it was the second test really as we had run it briefly at Simon's - and left the transmitter on for the journey home. So my first job was to remove the 40 mhz receiver and substitute a 2.4 ghz one from Giant Shark. Then, after pumping in a little water (the gauge was difficult to read), I turned the gas control anti-clockwise to switch on and lit up. There was no whistling - it worked a treat. After filling the lubricator and oiling round it was ready to go - and stop. It de-railed in about four places in one direction and two in the other. I had been expecting this from such a large and rigid loco, but it was a bit frustrating! The I put more water in from the pump and could see no change in the water gauge. Time to stop. It was clear that there was some limescale in the boiler, even if everything else seemed in mint condition. I added kettle descaler to the still warm boiler and toook the cap off the water gauge to give that a good clean. Then much rinsing out before adding a stainless wire inside the glass. 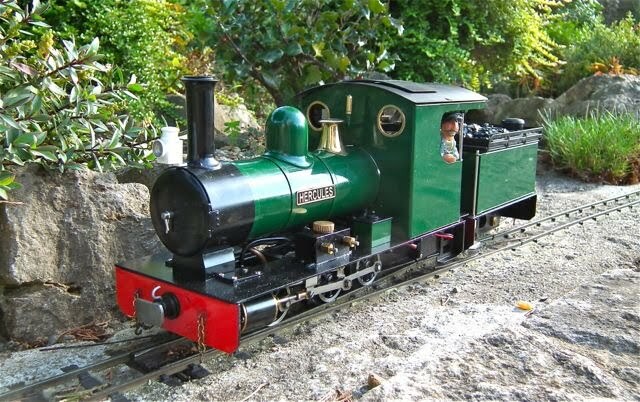 I also made a Chuffer using the large 3/8" resonator and used the Richard Page method to drift the smokebox front out. It was so easy - the smokebox front really is a robust casting! The safety valve seems to be of an early type, unlike the one in Tag Gorton's review (Garden Rail Feb 04). I had a Roundhouse Millie bonnet in stock but it was too loose. I turned a brass ring to fit tightly over the safety valve and the bonnet fits snugly on that. I will probably paint the dome green in due course. The next day I was determined to run it on my track and, in fact, I managed to get a good number of circuits in one direction without derailments. I was hauling the Swift Sixteen stock and, most important, I was running the boiler at just 20 psi which made it more controllable. I was pleased! Then I tried a more challenging load: two IOM pairs and three IOM four wheelers. Well with this load on, I got about two circuits out of twenty without derailing. So what was the cause of the problem? The rigid water pipe? The coupling to the tender? I thought about putting a flexible connection in the water pump pipe, but could see that this was at boiler pressure and would need a non-return valve. Mmmmmm.... Here is the cab showing the loco coupling and the connections to the tender. The copper one is the water pipe from the tender pump. The silver board is a temporary measure to protect the receiver from heat - the first one I used had significantly changed shape after the videoing. 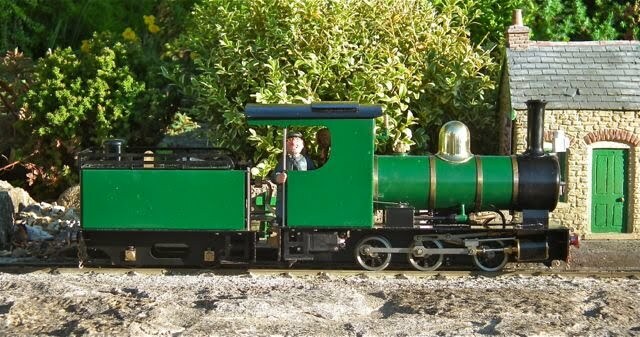 James had mentioned the need for a longer coupling, but it was only when I spoke to Simon Hoskins that he persuaded me that a longer coupling was essential. He told me that a longer coupling link would help avoid derailments, but caused problems with reversing. When I took it apart, I decided to modify the existing coupling to avoid that. I just drilled a hole and bolted on a short coupling bar. You may just be able to see it in the photo below. Here is another photo showing my rather crude coupling. A 2.9mm hole was drilled 10mm back from the centre of the tender coupling. The coupling bar was from an odd piece of 1.5mm brass with a 2.9mm hole and a 1.5mm hole at 11.5mm centres. I used a 6 BA screw and lock nutted it - it is a loose fit and needs to be. The loco coupling pin bears on the arc when reversing. 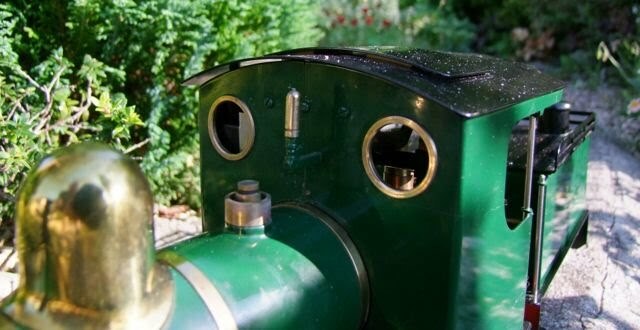 Although I like polished brass on a loco, the addition of the brass safety valve bonnet was just too much. I remember Tag Gorton wrote that it could be the dome or the bonnet - but not both. I decided to spray the dome, and I struck lucky in my quest for the right colour when I checked my tin of Brunswick green Humbrol enamel. It was spot on - but I didn't fancy a brush painted look. Then I remembered that I had an unused airbrush set with my large (Aldi) compressor. I got it out, Googled to find the paint proportion and whether white spirit is OK to use (it is). With two parts paint to one part white spirit it worked a treat. A good clean, degrease and etch prime and then it went into the oven at 100 C for 20 mins. I gave it three good coats of paint, with 30 mins in the oven between coats. It worked - though the finish is slightly textured, which takes the high gloss off it. The batteries are mounted underneath the cab roof, held by a wide metal strap. 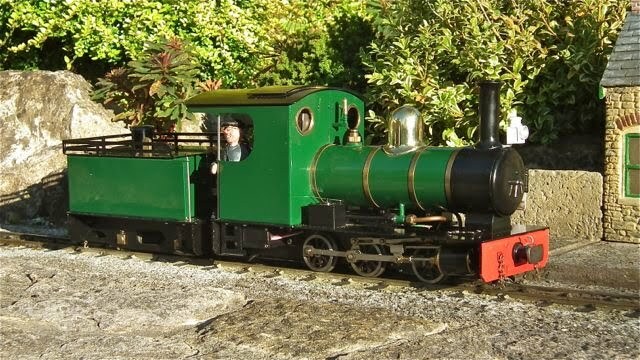 The set that came with the loco were NiCads and so their life was limited. 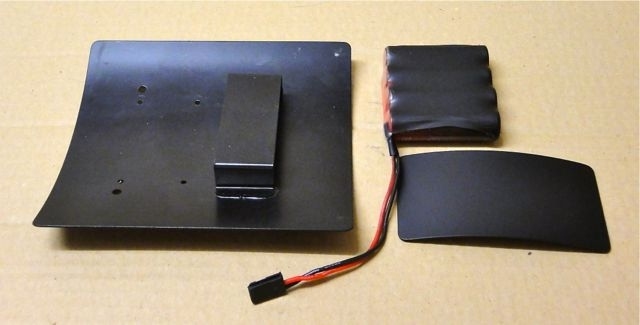 I ordered a NiMh battery pack from ebay, but found that although I could withdraw the old ones, I could not get the new pack in from the rear. The screws holding the cab roof to the cantilever bracker are under the aerial plate which is held on with sticky pads. I cut through these with a thin, sharp knife and removed the plate. The tiny screws came out easily but take great care as they are short and easily dropped. With the roof off, the battery pack fitted easily from the front, but I decided to spray the roof matt black before re-fitting. A thumbnail and white spirit removed the sticky pad residue and then both parts had a light rub down. It was then revealed that the steel roof has no primer and the bare metal edges were exposed by the lightest rubbing. After degreasing, I primed and sprayed all with Halfords Acrylic Matt black. Incidentally, I spoke to the guy who painted all the Cheddar locos yesterday. The apparently used an acrylic stove enamel that was baked at 180 degrees. I also gave the battery pack a quick spray as it shows from the rear. Reassembly was a real fiddle involving dropped nuts and screws followed by hunting on the floor with a magnet! The tender on Hercules is a working one with gas and water on board, but the top is very plain, suggesting an oil fired prototype. Well that was not for me as the Summerlands Light Railway is definitely "coal fired". 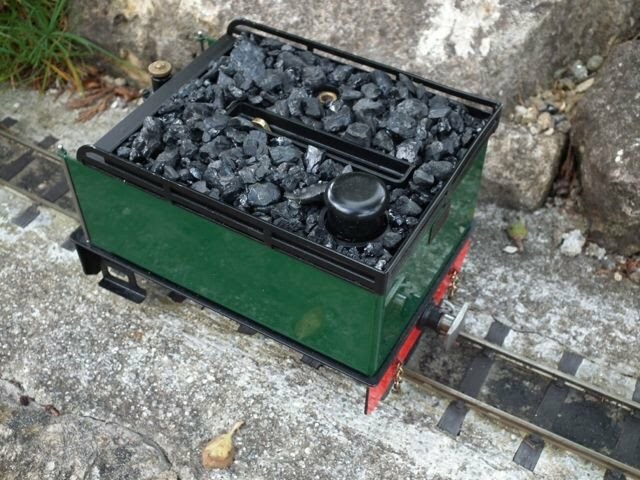 In Tag Gorton's review, he had stuck coal to the tender top using silicone, but I have heard that the pumps don't like grit or foreign bodies, so I decided to contain my coal load in a plate, fabricated from brass. I had a piece of thick brass and after cutting this to fit, I used K&S brass angle round the ebge, a piece of thicker 1/4" angle at the front, a couple of pieces of tube and some 2mm strip round the pump slot, which was chain drilled and filed to shape. My soft soldering, as you can see, was less than perfect, but I was not worried as it would be covered by coal. After soldering, I remocved the tender top (8 x 2mm cheesehead screws) and marked the holes underneath. It would have been better to do this before soldering! I then centre punched these holes and drilled underneath with a 6mm drill. I did not go right through, but just enough to sit over the cheesehead screws. Then it was a matter of rubbing down, degereasing and etch priming. I baked this in the oven for 20 mins at 80 degrees C and then spreayed it satin black. When that paint had been baked, I sealed the corners and any gaps with epoxy to retain the glue and then filled the tender with anthracite beans and some crushed beans. I drizzled a 50:50 PVA/water mix (with a drop of washing up liquid) on to this until all was wetted, then I tipped the excess out, wiped round and left it overnight in a warm place to set. The finished load just drops onto the tender top and gives access to all the workings. Having increased the space between engine and tender, to allow it to negotiate my 4'6' curves, the detachable fall plate no longer worked. I decided to make a new cab floor/fall plate combined, and give it a timber surface. I cut the footplate from about 1mm brass and etch primed it before painting it satin black. I then cut some 10mm spruce planks and stuck these on with silicone before staining them 'black'. The result looked a bit like dark sapele, which was not ideal. Then, when I tried it on the loco, it looked all wrong. I decided that the fall plate couldn't be wood, so I cut across the planks with a razor saw and removed the rear part. The team approved! So here is the loco with the footplate temporarily fitted. it will be stuck in with silicone.